College and professional basketball leagues are constantly tinkering with their rules regarding the court. Men's college basketball changed its three-point line in 2008-2009, and that standard has fluctuated in professional basketball as well. Women's basketball has standard court measurements in college and professionally, but some are still different from the men's game. Although many courts are standard size, not all college and professional basketball courts are the same length. Professional courts must measure 94 feet in length, a distance that holds true for women's professional play also. 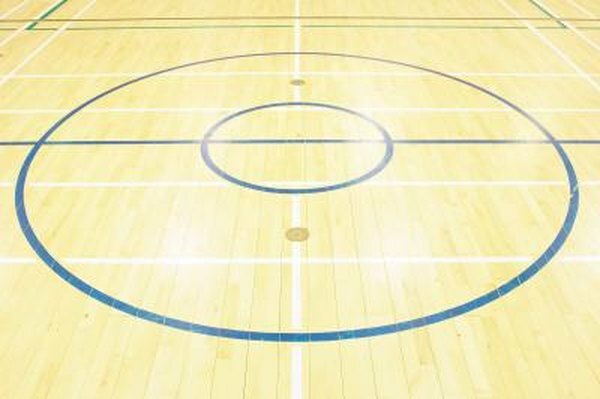 Many college courts have the same length, but some college courts are actually 84 feet in length, usually because of age or a lack of space to use a full-length court. Eighty-four-foot courts cut off 5 feet on each side of the court between the mid-court stripe and the three-point line. Professional and college basketball use different distances for their three-point line, beyond which shots count for three points instead of two. The professional three-point line starts at 22 feet in the corners and runs that length for 14 feet on each side of the floor until the arc begins. Around the arc, the professional three-point line is 23 feet, 9 inches from the basket. The collegiate men's three-point line is 20 feet, 9 inches from the basket. Women's college and professional basketball both use the former men's college three-point line of 19 feet, 9 inches. The men's college and women's three-point lines are perfect arcs, meaning that the distance from the basket does not change at any point around the arc. The lane or paint is the area inside the free-throw lane. The college basketball lane is 12 feet wide, while NBA rules set the lane width at 16 feet. College and professional women's basketball both use a 12-foot lane. All levels of play have the same distance to the free-throw line, or top of the lane: 15 feet from the front of the rim and 19 feet from the baseline. The NBA has a restricted area in the lane that men's college basketball and women's basketball do not use. According to NBA rules, this restricted area is a half-circle that is drawn 4 feet from the center of the basket. When a player is touching or inside this restricted area, defensive players cannot take a charge, which means that offensive players cannot be called for charging against a defender standing inside or on this area.